What? You can't see me? Well look close. Very close. Waffles Too and I are actually *gasp* sharing the bed. Just like with Gloman & Glogirly. Boys on the left. Girls on the right. That's kinda how we "share" the bed, but it definitely counts! Happy Sunday! I've been known to share a bed like that with Ichiro. I saw your head right away Katie! You were doing what Bobo used to do. I love how you are both sharing the bed. So cute! Little orange guys are pretty irresistible. AllieP: Thank COD we're segregated over here tongiht too. Father decided to *delicate cough* refinish the floors. I'm safely hiding in the master bedroom (emphasis on MASTER, boys!) while the brats are tucked into a guest bedroom where hopefully they'll do no harm. Notice I'm not holding my breath? Waffles looks so tiny on that big bed! Have a super caring sharing Sunday. How funny - it is boy on the left and girls on the right here too... which means the right side of our bed is rather crowded! I think Waffles is waiting for you ! I bet the Mr and Mrs sleep a bit closer than you two. Good work though - the gap is getting closer. It's boys on left girls on right here too. We're amazed that you're on the same bed! Have a great Sunday. At least he knows his place is at the FOOT of the bed and your place is at the HEAD of the bed. We thinks that it is just about the most quietest we have seen Waffles TOO yet... Maybe the sandman saw himt there and thought you needed a break, so he hit him with a fistfull of sleepy sand! It's the same here...boys on left girls on right except when we want to cuddle....then we all pile on Mom! We share the bed the same way, by ignoring that each other are there. It's much better than the alternative, when Newton pounces on everybody else. thank COD for your impenetrable pillow fort. you're safe for now. good lucks. Waffles Too appears to want to cuddle Katie. Isn't it great to be adored? 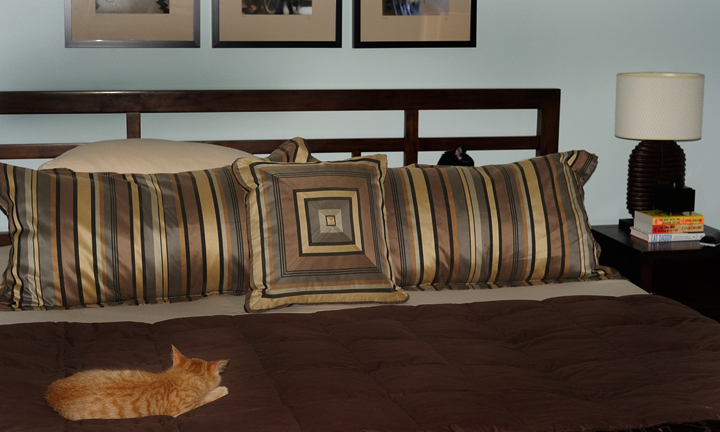 You got the best spot—the pillows! Those are off limits in my house. BTW, is the mattress like cement or do you have a pillowtop? That's pretty much how I am with sharing my space. We're considering a second kitty for our extra-shy kitty so that she can have company. We'll see what the vet thinks. YIKES - the next step will be a cuddleepile! That I gotta see! Not long now before they'll be sleeping in a pile!! You get the big comfy pillows, he gets the bed, sounds about right! 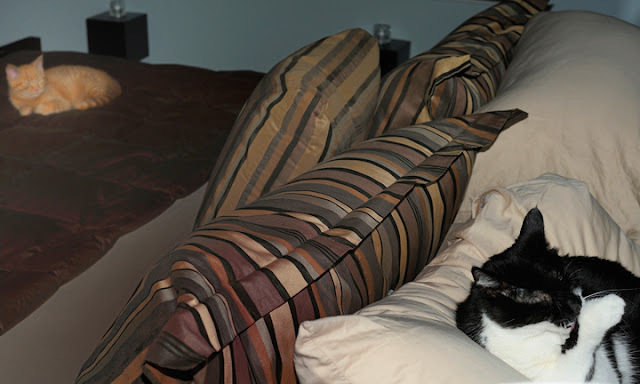 Sort of sharing, but we notice you have barricaded yourself behind the pillows Katie. Katie are you cleaning up and getting ready to pounce? Before long the two of you will be snuggling up together. Wow, Katie, you are making a lot of concessions for this cat! Brilliant use of the extra pillows for barriers! I'm impressed! -Isabel Atherton, big fan, Tribe Atherton. Whoa--this is B-I-G. But I gotta say, katie, this doesn't seem right to me. How come W2 gets to be all lordly and out in the open and you are sort of hiding? Whose in charge here anyway??? Looks very cuddly to me! Separated by mountains of pillows, I see. For now, at least. Did you at least hiss at him? Purrrrrrrrrrrrrrs.